The redevelopment of the former Royal Ordnance munitions works in Chorley, Lancashire is the location of one of the first sustainable highway drainage schemes to be fully adopted by a UK local authority, according to ACO KerbDrain. The former Royal Ordnance munitions works is one of the largest brown field development sites in the country. Acquired from BAE Systems by developers Redrow and Barratt, the 395 acre site has been transformed into an environmentally sustainable urban village. In granting permission to develop the site both Borough and County Councils stipulated that the existing site access had to be upgraded to relieve the predicted increased traffic loading on the surrounding villages and on the main A49 link to the M6. Combining this within Redrow’s commitment to include the highest degree of sustainability in its development of the site lead to a Sustainable Urban Drainage System (SUDS) being proposed for the new site access. The adopted design introduces swales on both sides of the carriageway along 80% of its 2km total length. Each has a depth of between 400mm and 800mm and an effective width of 2.5m. The profile provides the required attenuation and groundwater recharge characteristics to cope with the surface run-off from a 100-year storm. Seeded with a hard-wearing grass, the velocity of the water is minimised and the primary filtration improved within the swale by maintaining a cut length of 50mm. 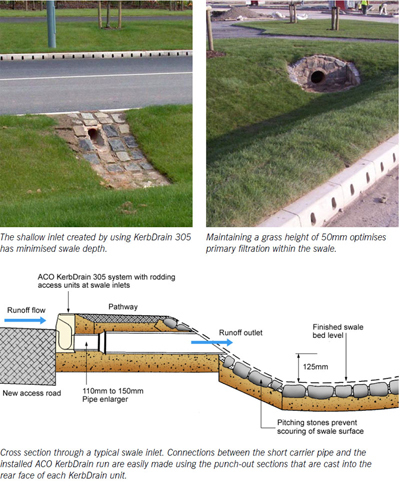 As ground levels across the site do not fluctuate significantly, the majority of the swales achieve near static attenuation of the run-off by simply following the contour of the road surface. However, a short section of the road close to the link with the main A49 has a gradient of 1 in 20. Under heavy rainfall conditions, run-off velocity within the swale would cause ‘scouring’ of the surface and potential flooding downstream. This has been overcome by ‘stepping’ the bottom profile of the swale, effectively reducing the overall gradient to 1 in 80. “A critical element of the design is the method used to control the flow of run-off into the swale,“ Steve Openshaw, technical manager at Redrow said. “We needed a system that would be easy to install and maintain, minimise visual impact and not require any additional excavation within the proposed swale. It would also need to allow surface water to return to ground as close to the point at which it fell – a vital criteria for SUDS. The automatic doors are an important component of the new building on the Treforest campus which incorporates sustainable materials, including low voltage LED lighting and a self-heating, self-cooling system. 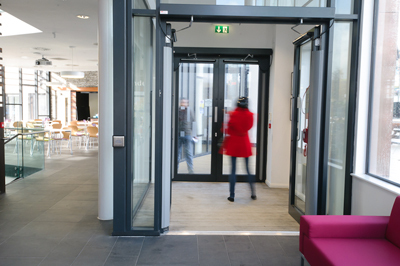 Research has shown that the electricity cost to operate an automatic door system can be as little as £32 per year but they can make a significant contribution to energy savings, making automatic doors the ideal choice for the university. The Compact Operator converts manual doors to automatic openings in both existing and new buildings. The Operator offers quiet and smooth operation and is ideal for installation in a wide range of public access projects, particularly in the education, health, retail and commercial sectors. Kingspan Insulated Panels has installed 2,900m2 of Kingspan Roof PowerPanel System photovoltaic modules on the roof of one of the south-facing manufacturing buildings at its Holywell manufacturing facility. The building already consists of a number of Kingspan’s own products, from insulated panel systems to passive solar renewable energy generation in the shape of the EnergiPanel system, which produces solar air heating. The 406.08kWp photovoltaic system, which comprises of 1,728 235Wp Yingli crystalline PV modules, is expected to generate circa 350,000 kWhr per annum, making a significant contribution to powering the plant’s electricity needs. The system was commissioned and approved by Scottish Power on the 7th July and has been generating power since then. It is predicted to save 163,876 Kg/CO2 per annum, allowing the company to make its own important contribution to the carbon reduction imperative. It took just five weeks to complete the project, and the maintenance of the Kingspan PowerPanel has been made both safer and easier with the installation of Kingspan Safetraxx, an off-ridge fall arrest system. Kingspan aims to power all of its manufacturing sites from renewable energy sources, and the next step to complete the process at Holywell will be the commissioning of a large wind turbine to further supply the factory’s electricity needs. A small turbine and photovoltaic cells have already been successfully used on site since 2006, providing electricity to the Kingspan energi centre. The typical UK home loses approximately 33% of its generated heat through poorly insulated walls. 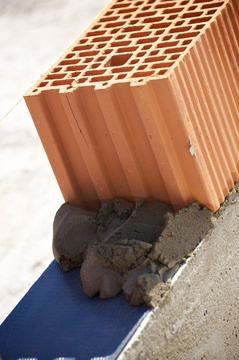 To combat this, Lime Technology has launched two new External Wall Insulation (EWI) systems. 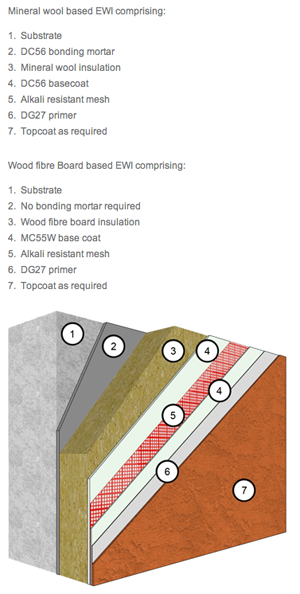 The two EWI Systems – one based around mineral wool insulation, and the other around wood fibre board insulation – offer breathable solutions and have been designed for upgrading existing residential and multi-storey buildings or to provide an attractive and thermally efficient building envelope in new-build construction. Both systems will help to meet Building Regulations and legislation for the improvement of energy efficiency and reduction of carbon emissions. “We are only offering breathable lime-based systems with breathable insulation as opposed to petroleum-based EWI systems which are impervious and seal moisture inside a building. Our systems suit those customers who are concerned about moisture build up in the wall or who are retrofitting older buildings where these issues are more prevalent,” said Lime Technology’s Sue Dewhirst. The Mineral Wool System has been designed and developed to provide a completely vapour permeable system with the use of mineral wool board insulation. Mineral wool insulation is made from rock fibres and offers superb acoustic, thermal and breathable properties, as well as dimensional stability and fire safety to meet the requirements of commercial and multi-storey buildings. The Wood Fibre Board System also offers superb vapour permeable properties. Manufactured from renewable materials and completely recyclable, it delivers excellent thermal insulation performance and a low carbon footprint. Offering a more natural solution, it incorporates wood fibre insulation which is fully recyclable and has been declared harmless by the European Union directive 97/69/EG. LowC Communities has announced the arrival of a revolutionary new biomass CHP technology that will boost the UK’s ability to secure a clean, sustainable and low-cost decentralised energy supply. 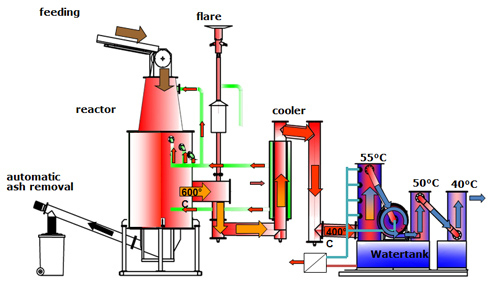 Using locally-grown, sustainably sourced wood, the technology, named Arbor ElectroGen, uses a, advanced form of gasification: the wood is decomposed at very high temperature in a chamber that has low levels of oxygen present, which produces a combustible gas. This clean gas is captured, cooled and used to power a combined heat and power system (CHP) to generate electricity and heat for use in space heating, hot and chilled water applications. Due to the efficiency of the process – coupled with use of a renewable fuel that’s absorbed carbon dioxide during its lifetime – the technology offers incredibly low carbon energy. A 500kW system will annually produce around 4,000 MWh of renewable electricity and 6,000 MWh of renewable heat, saving around 3,000 tonnes of carbon emissions from just 3,440 tonnes of renewable fuel. This would equate to the annual carbon emissions from 500 typical three-bedroomed homes. Richard Griffin, chief executive of LowC Communities, said: “Many companies have tried to produce electrical power from biomass fuels such as wood, but they’ve either failed or only managed to achieve low levels of efficiency and reliability. Importantly, this also includes old coal-fired power stations that have been converted to run on imported wood pellets – particularly as they dump most of the waste heat produced by the electrical generation process. At one pilot project, the gasification system will be installed on a well-established country estate and produce heat and power for the estate buildings and around 80 homes. The system would create the UK’s first ‘carbon negative’ community applied in a retro-fit manner. It will also export any surplus low-carbon electricity produced. Architectural panel manufacturer Panel Systems has supplied Aluglaze panels for a new out-of-town supermarket in Berwick-upon-Tweed, Northumberland. The Aluglaze panels have helped created a light and airy shopping experience for this major supermarket chain. The architect on the project specified 100m2 of insulated panels in light grey, which will achieve a U-value of 0.97W/m2K, as part of improving the energy efficiency and reducing the carbon footprint of the building. Panel Systems worked closely with the glazing manufacturer to supply the panels on call off within a tight schedule, which ensured the project met its deadlines. Each Aluglaze panel from Panel Systems was manufactured from a 2mm aluminium sheet vacuum bonded to both sides of a Styrofoam core, creating an overall thickness of 32mm, which fitted directly into the aluminium glazing system. The panels had a 60 micron thickness powder coating in light grey to meet the performance requirements of the marine location. Styrofoam was specified because of its excellent insulation properties, which ensure the building remains warm and comfortable for shoppers and staff all year round. Architectural panels such as Aluglaze from Panel Systems consist of three or more materials that are laminated in its factory to form a structurally insulated unit. Each panel features a low density insulated core material and high density facing and balancing materials to ensure a rigid structural panel. The panels are designed to span over large areas, which gives the specifier greater flexibility when considering the overall design. Panel Systems has the experience and expertise to work with a range of facing materials, such as lamina, trespa, timber, plastisol steel and aluminium to name but a few. This means the Panel Systems range of architectural panels can satisfy specifier’s requirements for aesthetics, longevity, acoustics, thermal insulation, fire and impact resistance. Prater has recently secured a contract with blue chip organisation, Siemens, for its £30m Urban Sustainability Centre in Newham. The building will showcase new technology from around the world and new ways of living and working in a more sustainable way. Responsible for the complete design, supply, installation, testing and commissioning, Prater has specified a roofing package with photovoltaic (PV) panels which will enable the centre to achieve a BREEAM Outstanding rating. Stuart Whiting, Prater Solar Manager said: “The demand for greener, more sustainable construction solutions are ever on the increase, so to have the opportunity to work on this project is a move in the right direction for Prater and the construction industry as a whole. Prater will install 1375m2 of PV panels on the triangular shaped Kalzip standing-seam roofs, with custom architectural in-fill panels to provide ‘clean edges’ to the arrays. 200m2 of PV modules will be fixed to the composite metal panel roofs over the roof lights. The PV panels are expected to generate approximately 245MWh every year and deliver an estimated CO2 saving of 145,000kg per annum. The planned cable car link between the O2 Arena and the Excel Exhibition Centre will pass just a few metres above the roof of the Urban Sustainability Centre meaning that this will be one of the most visible installations in the UK. The centre will act as an exhibition centre for use by the public during the London 2012 Olympic Games and is expected to attract around 100,000 visitors every year. Rehau has launched a new casement solution which achieves a U-value of 0.8 using either the Rehau S706 or Rehau Edge 70mm systems. The new Rehau Thermo window has been deliberately developed using proven and cost effective off the shelf profiles so that fabricators can begin manufacturing straightaway without any special machining or tooling set up and with no requirement for separate stockholding. The new Rehau solution is based around standard S706 and Rehau Edge profiles combined with a triple glazed, argon-filled 44mm sealed unit. A single leg bead from Rehau’s In-line patio range, which has been proven for many years with panes up to 1200mm x 2100mm, neatly accommodates the glass. Rehau Thermo is an open out, casement window which has been fully weather tested to 600Pa, has achieved security accreditation to BS7950 and is fully certified to the 0.8 U-value at the standard size of 1230mm x 1480mm. The new Rehau Thermo foam insert is applied either during or post manufacture to provide the additional thermal efficiency necessary to achieve the 0.8 U-value target. Developed and already proven in Germany, it uses a moulded foam material which is easy to handle and dust free when cut. Supplied in one-mere lengths, the Rehau Thermo foam can be inserted into the chamber of the profile during manufacture or, to minimise disruption and to provide a very visible USP, it can simply be inserted into the legs on the outer edge of the window either by the fabricator after manufacture or on site by the installer. 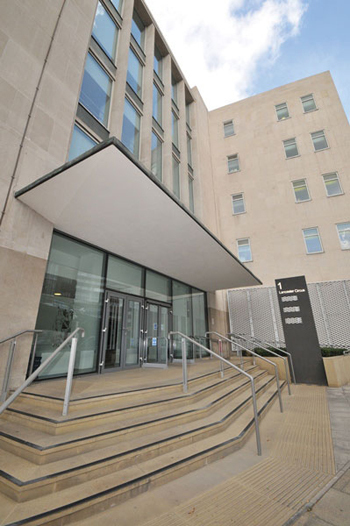 Schneider Electric has installed a new, intelligent building management system (BMS) for Birmingham City Council’s (BCC) 1 Lancaster Circus property. Located in central Birmingham, the five-storey officeblock houses around 2,000 employees at any one time, working across various council services including Urban Design, which is responsible for managing the BMS. BCC’s Urban Design, controls some 200 of the council’s properties across the city, from schools and leisure facilities to social services centres all using the Andover Continuum BMS or early derivatives. Schneider Electric, in conjunction with electrical contractors, Dodd Group, completed a £550k total system overhaul, installing a brand new, energy-efficient, Andover Continuum BMS to control the building’s HVAC systems. 1 Lancaster Circus had been suffering from ‘sick building’ syndrome on both a cosmetic and functional level. The previous BMS had been in place for 25 years and had been extensively reworked and added to with various different pieces of technology over time. The new BMS allows the operating manager full control of the HVAC systems on every storey of the building. There are centralised plantrooms on the roof and in the basement areas containing the main heating, cooling and ventilation plant. The main heating plant is connected to a district heating system that provides heat for a number of buildings (including the Children’s Hospital) in the local vicinity. Each floor consists of open plan spaces and a number of meeting rooms. The open plan spaces are cooled by over 70 chilled beams per floor, which are controlled in zones by the Continuum system. The meeting rooms are cooled and heated by Fan Coil Units (FCUs), each one individually controlled by the BMS. Zoning chilled beams and allowing individual monitoring and control of FCUs increases energy efficiency and thus reduces a building’s carbon footprint, by supplying only the required amount of energy to each terminal unit at a certain time. Lancaster Circus’s gas, electric and water systems are also integrated into the BMS using Schneider Electric distribution boards and LV panels, offering a central point of energy monitoring and profiling. Schneider Electric’s web-based Energy Remote Monitoring (ERM) system is installed across a number of sites in the BCC estate providing an aM&T system which provides the client with meter data and readings on a day + 1 basis. A Lancashire school is building an eco-friendly extension. Children from St John’s Southworth RC Primary School in Nelson, East Lancashire, have been learning about the natural and thermally efficient building materials which are being used to build their new classrooms. Youngsters from the Lomeshaye Road school swapped the classroom for the construction site to see for themselves how their new extension is coming along. After having cut the sod, taken part in a health and safety briefing and designed their own safety posters for Accrington-based contractor Rosslee Construction, the children are now being introduced to the two main building components – Wienerberger’s Porotherm thermal clay blocks and Second Nature’s natural insulations, sheep’s wool Thermafleece and Edenbloc recycled carpets. St John’s Southworth RC is an Eco School and pupils have been closely involved in the design of the building. The designer, Emma Palmer from Campbell Driver Partnership, has specified building materials which come from natural sources and is keen for the children to have an understanding of the construction process from beginning to end. Emma said: “Environmental awareness is very important for the school which has embraced the eco agenda and incorporated green issues into all parts of the curriculum. It follows, therefore, that the new school extension should be as eco-friendly as possible and one of the best ways of doing that is to use products from natural and recycled sources, in this instance clay blocks, sheep’s wool and old carpets. “These, when combined, also help to improve the thermal efficiency of the 1970s building – reducing energy use and carbon emissions. Other measures, such as the contractors using recycled rainwater as much as they can, are also contributing to this being an extremely sustainable project. 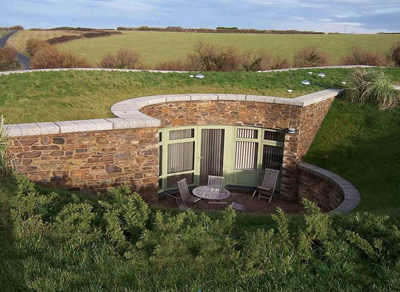 A combination of Alumasc ZinCo Biodiverse and Extensive Green Roofs has been chosen for an ecological project at Trevose Golf and Country Club in Cornwall. Seven new holiday lodges have been designed by Architects Lilly Lewarne, to an eco-friendly specification, replacing the original timber visitor chalets which were erected in the 1950s. The main contractor on the project was Midas Construction. Alumasc’s ZinCo Green Roof system was specified to ensure that the lodges blended with the fairway and outreaching landscape. The lodges are located on Trevose Head, a spectacular natural landscape on the North Cornish coastline and a designated Area of Outstanding Natural Beauty. They are visible from the clubhouse and required a sustainable roofing solution to minimise their visual impact on the golf course and surrounding areas. Alumasc’s ZinCo Biodiverse Green Roof system was specified for Lodges 1-3, using a combination of turf and planting to blend in with the green at the 18th hole of the golf course. The existing fairway was continued up the side of the new building and formed part of the grass roof. The Biodiverse planting scheme was chosen carefully to suit the area and attract local species of insects. Lodges 4-7 are camouflaged by a grass bank but required a green roofing solution due to their visibility from the club house. Alumasc’s low-growing ZinCo Extensive Green Roof system was used, comprising self-sustaining sedum plants which are wind, frost and drought resistant. These plants will eventually establish themselves to form a natural habitat for existing wildlife species in the area. The depth of the growing medium and the detailing of the penetrations through the Lodge roofs posed massive challenges for the waterproofing, with the main problems being presented by sun pipe roof lights. Together with the Project Manager at Trevose, Alumasc’s Approved Installer Western Flat Roofing devised unique solutions to overcome the challenges presented by these intricate roof details. A plinth was built onto the existing roof and extended lead sleeves were made to accommodate the lights and pipes. The waterproofing membrane was then taken to the top of the lead for the root protection. Completion of the detail at the junction between the roof and the tanking to the walls was painstaking and time consuming, but has resulted in the lodges being almost invisible when viewed from outside the site. 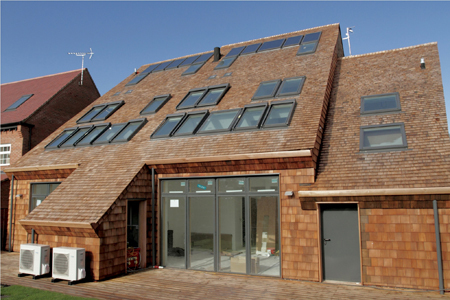 Western Red Cedar shingles from John Brash have been specified for the external envelope of two zero carbon homes in Kettering as part of Velux’s Model Home 2020 project. HTA Architects created the properties, which are designed to promote light, airy homes that enhance resident well-being. John Brash’s Western Red Cedar Shingles were specified by Velux, following their successful use on a previous low carbon build project, and fitted by Reed Roofing Midlands. Named the Velux CarbonLight Homes, the pair of semi-detached three and four-bedroom family houses were commissioned as part of a new development. The aim is to create light, well ventilated, zero carbon houses which can be reproduced easily by large housebuilders, and which have a high ‘liveability’ factor. The properties are being constructed by Willmott Dixon on Bovis Homes’ Charter Park development in Kettering. They are designed to deliver a 70% reduction in carbon emissions, with the remaining 30% offset through allowable solutions. Five other Velux homes are being completed across northern Europe, adapted to local cultures, climates and architecture, as part of the company’s Model Home 2020 project. The properties are due for completion in the summer of 2011, but have already received the Innovation Award for Building Technology at last year’s prestigious British Homes Awards (BHA). The John Brash Western Red shingles used on this project meet the stringent requirements of the Red Cedar Shingle and Handsplit Bureau's Blue Label Certigrade. The Blue Label grade ensures that all shingles and shakes are made from cedar that is 100% heartwood, 100% edge grain and 100% clear. A new facade of curtain walling by Kawneer has helped a refurbished office block realise a 29% improvement in carbon reduction over an equivalent building. Kawneer’s AA100 curtain walling, in SSG (structurally silicone glazed) and capped versions, plus AA601 fixed light casement windows and series 190 heavy-duty commercial entrance doors feature on Yare House on Thorpe Road, one of the principal routes into Norwich city centre. The £3 million refurbishment executed by main contractor Morgan Sindall for client Highlight Consultancy has transformed the 1970s four-storey brick and glass building both aesthetically and in terms of its performance. Previously solely occupied by Anglian Water, this refurbishment will now provide sustainable flexible office space in the heart of Norwich for up to 10 businesses. The front, south-facing facade formerly experienced excessive levels of solar gain which was inefficiently controlled by internal manual blinds. This has been replaced with Kawneer‘s AA100SSG curtain walling incorporating solar double glazing. The Kawneer curtain walling extends up to incorporate an additional 475m² storey that provides an oversailing roofline sun buffer under which a series of louvres are hung from curved vertical columns, offset from the building line. Such measures have helped this 3,040m² Grade A office building achieve an Energy Performance Certificate ‘B’ rating and also a BREEAM rating of ‘Excellent’. Project architects Ingleton Wood carried out a carbon emission comparison over a building with equivalent standard gas boilers and cooling system which showed a 28.69% improvement. The high performance facade contributes to this with reduced pressure on the M&E system to perform. The new south facade of silicone jointed Kawneer AA100 curtain wall , capped AA100 curtain walling to the new floor west facade, AA601 windows to the new floor north facade, series 190 manual and automatic doors and a simple glazed canopy over the main entrance, were installed over 10 months by approved specialist sub-contractor Drayton Windows. 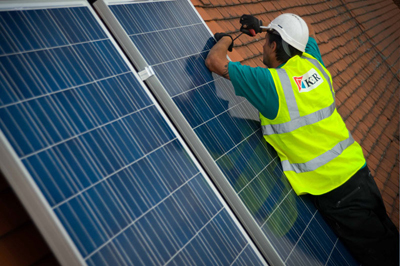 Over the last two months, Kier’s energy solutions team has been included on a framework agreement with Efficiency East Midlands and on a Pro 5 framework led by Yorkshire Purchasing Organisation, as well as winning a number of solar PV projects worth some £6 million. Included in this successful round is the installation of solar PV onto existing social housing properties for Cottsway Housing Association in West Oxfordshire. They are using the advanced technology afforded by PV to improve energy efficiency in their tenants’ homes and to reduce annual running costs. Under the framework agreement with Efficiency East Midlands alone, there are some 15 residential partners including housing associations and councils that are responsible for the upkeep and repair of over 134,000 homes with many more in development. Through this framework Kier has been successful in a mini tender to win a mass retro-fit of solar PV panels onto 480 existing social housing properties in Nottingham. The scheme for Nottingham City Homes, to be completed by the end of March 2012, comes at a time when energy costs are rising. The project will help reduce energy bills for people taking part in the scheme within Nottingham. 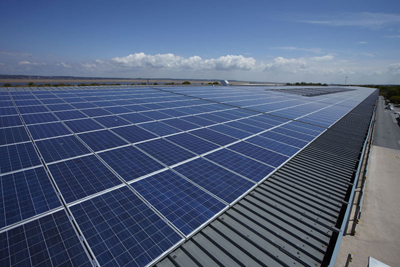 The Pro 5 framework agreement led by Yorkshire Purchasing Organisation will involve the provision of solar PV onto properties across the country. 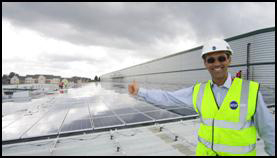 In both cases the framework agreements approve Kier for the complete supply and installation of solar PV systems from undertaking site surveys and designing systems to working with local Building Control, conducting Feed-in Tariff administration, commissioning and testing and also operational monitoring and maintenance for the lifetime of the system. Marley Eternit’s fibre cement profile sheeting has been specified on the Woodland Trust’s new headquarters in Grantham, Lincolnshire. The £5.1 million BREEAM Excellent rated project had to achieve a reduced carbon footprint, while demonstrating long term value for money. Fibre cement Profile 6 from Marley Eternit was used on the roof, which has a mono pitch of 11.5º. The Woodland Trust’s innovative headquarters is shaped in a descending spiral representing a curled fern leaf, wrapped around a central woodland garden. Profile 6 was an integral part of minimising the carbon footprint and achieving the BREEAM Excellent rating. UK manufactured fibre cement profiled sheeting achieves an A+ rating in the BRE (Building Research Establishment) Green Guide to Specification based on generic rating for UK produced profiled air cured fibre cement sheeting (outer skin). The roof and walls of the building are insulated with a mulched natural wood-fibre product, and both are designed to be breathable. The Profile 6 sheets are also breathable as fibre cement is vapour permeable yet waterproof. That means if any moisture from inside the building does penetrate the Vapour Control Layer under the insulation, Profile 6 will allow it to diffuse to the outside, limiting the amount of condensation within the roof structure. PVC-U profile producer, Spectus Window Systems, and window fabrication and installation partner, Worsley Glass, are helping to transform a Manchester community in partnership with Manchester City Council, Miller Homes and framework contractor GB Building Solutions. Over 160 properties across four streets in the Moss Side area of Manchester are being completely refurbished with a view to them achieving an EcoHomes rating of Very Good, as part of a £17m council-funded regeneration project. The environmental retrofitting project, which began in mid-2010 and is due for completion at the end of this year, has seen council-owned, part-owned and owner-occupied properties receive insulated render systems to the rear of the buildings, roof replacements and loft insulation, facelift work to the front in the form of repointing, repairs and cleaning, and new front and back doors – all contributing to huge improvements in the buildings’ thermal efficiency. Spectus supplied its Elite 70 U-PVC windows through its fabricator, Worsley Glass, which also installed new timber doors and aluminum windows at the properties. 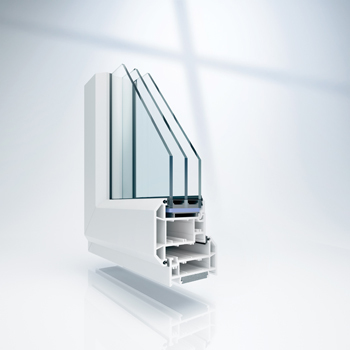 Spectus’ Elite 70 system has a multi-chambered profile, which can achieve a Windows Energy Rating of Band A. An additional factor that led to Spectus Elite 70 being specified by Manchester City Council’s architect was the fact that Spectus offers its profiles in over 60 coloured finishes as part of its Spectrum foiling range, meaning they deliver on aesthetics as well as performance. 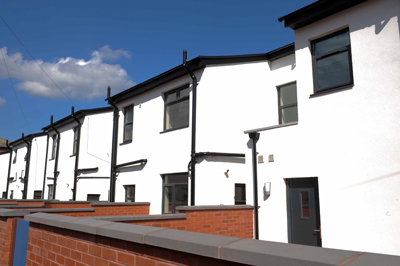 Manchester City Council specified Spectus’ Elite 70 in a grey 7016 foil to complement the aluminium composite windows at the front of the properties. Sixty-four of the properties on the project have also received full internal makeovers, and the streets themselves have benefitted from work including new street lighting and extensive landscaping. House prices in the area have risen by an average of £20k. The centre of Bristol is being reinvented with the largest mixed use development to have been built in the city for 20 years, bringing back into productive life a former brewery site that has lain derelict for 10 years. Centrepiece of the Finzels Reach development is Bridgewater House, the largest speculative office development on site outside London. 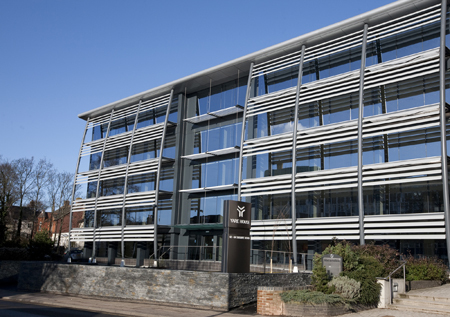 Bridgewater House is itself centred on a five-storey, three-sided glass atrium, incorporating steel framing systems from Wrightstyle, the Devizes-based steel glazing specialist. The £255 million Finzels Reach development, named after a Victorian sugar importer who had a factory in the area, will comprise 399 apartments, 400,000ft2 of offices and 87,000ft2 of shops, cafes, restaurants and other leisure facilities, while also incorporating a number of protected and listed buildings. Bridgewater House comprises some 110,000ft2 of Grade A office space, set to be rated as BREEEAM Excellent and is one of three office buildings in the development. The full-height atrium is designed to bring maximum light to each intermediate floor and provide 30 minutes of integrity and insulation. The advanced framing system also had to deliver acoustic control and was designed so that floor levels can be sub-divided to different occupants without impacting on fire compartmentation – a complex design challenge for which Wrightstyle has become internationally recognised. Finzels Reach, due for final completion at the end of this year, is already a landmark in the city and will become a new commercial, social, retail and cultural hub. Apart from the commercial space, over 1,000 people will live in the development, and Temple Cross at the centre of the scheme will be one of the city’s principal public areas. A state-of-the-art pedestrian bridge, in the shape of a Mobius strip, will connect the site with Castle Park on the opposite bank of the Avon, with landscaped walkways along the riverside. Sainsbury’s has won planning permission for a new supermarket in Wadebridge, Cornwall thanks to help from local architects Stride Treglown. The store is set to be one of the most sustainable Sainsbury’s stores in the country with a biomass boiler, solar panels and rainwater harvesting, as well as roof lights and high level glazing to maximise the use of natural daylight. The supermarket will also use a ‘smart grid’ system which reduces the amount of electricity taken from the national grid at peak times by turning down heating, ventilation and lighting systems. A biofuel generator which is entirely powered from Sainsbury’s cooking oil waste is also activated at peak times to produce electricity onsite. The planning permission was granted by Cornwall Council's Strategic Planning Committee and comes after many letters were written in support of Sainsbury’s being the preferred store for the area. A construction start date is yet to be confirmed, however it is hoped the store will open early 2013. AGC Glass has been used on the new Business School and Student Hub at Manchester Metropolitan University’s city centre campus. The diamond-shaped building’s facade is constructed from around 8,000m2 of unitised panels, alternating between flat vision panels and projecting bay panels assembled using AGC Glass. A cantilevered section, featuring a dichroic film from a specialist supplier incorporated into the projecting panels, creates a different colour effect depending on the angle from which the building is viewed and the light conditions. The building’s dynamic design also includes extensive use of grey and white ceramic fritting, supplied by Croatian glass processor Formator, to the internal and external faces of the double glazed units to achieve the architect’s desired aesthetic effect as well as to control heat gain and modulate light into the building. 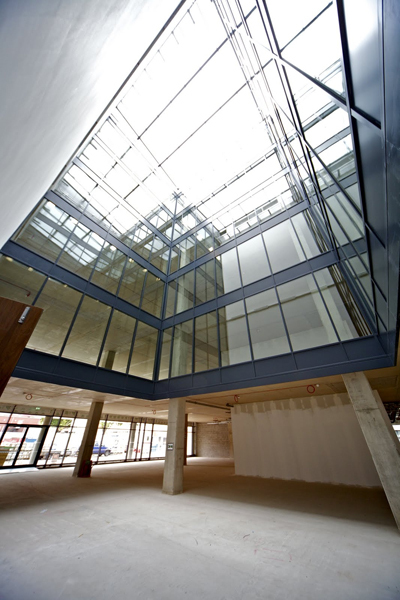 AGC worked in partnership with internationally renowned facade specialists, Permasteelisa. In addition to a 1.2W/m2K U-value, the new building required a combination of high performance tempered glasses from AGC including pyrolitic reflective, low-emissivity and low iron ultra clear products. The building’s glazed façade involved almost 10,000m2 of AGC’s Stopsol Supersilver Clear reflective glass to provide enhanced solar protection and high light transmission. In addition, 1,000m2 of 10mm Stopray Clearvision 50T from AGC was specified. This magnetron coated low-emissivity solution combines solar control in summer with thermal insulation in winter, and has the added benefit of Clearvision’s extra clarity. This option is also one of AGC’s toughenable coated glasses, designed to optimise processing efficiency, flexibility and profitability. 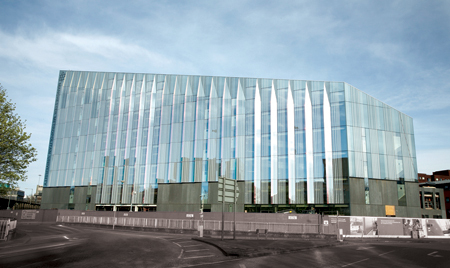 Manchester Metropolitan University’s new Business School and Student Hub boasts strong green credentials with the use of renewable energy sources, energy efficient heating and lighting, and high performance glazing courtesy of AGC and its partners. 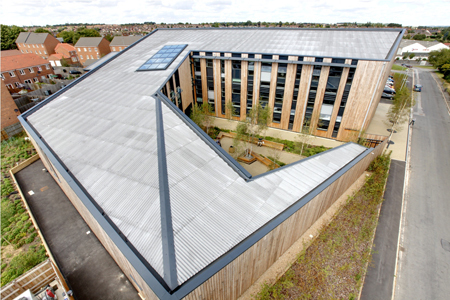 The building has been certified ‘Excellent’ under the BREEAM environmental assessment scheme. Covers Builders Merchants installed Azur Solar products on six of its branches in southern England. The result of which, the firm benefited from extra income, as well as selling it on to domestic customers. Solar PV installations have been completed at an initial six Covers locations and these are now being used as reference sites. They comprise both the Covers Home Ideas store and the Covers Trade Centre at Chichester and the depots at Aldershot, Bognor, Gosport, and Portsmouth. So far 2,055 panels and 26 inverters, delivering a total of 473 kWp have been commissioned. Covers plan to install Solar PV on two more depots later in the year. Covers selected Azur Solar’s unique Azur 2P self cleaning, self healing coated panels for its coastal branches as they not only help prevent sea salt and other particles covering the panels but they also produce up to 15% more lifetime power.